Indego Personal offers users with spinal cord injury a new level of independence at home and in the community. At just 26 pounds, Indego’s elegant design has no exposed cables or upper-body apparatus and does not require bulky backpack mounted components. Mirroring natural human movement, lean forward to initiate standing or walking and lean backward to stop and sit. An Indego app on your mobile device allows you to control operation, change settings, and capture data without the need for tethered controls. A slim profile is compatible with standard mobility aids and can be worn while seated in a wheelchair. 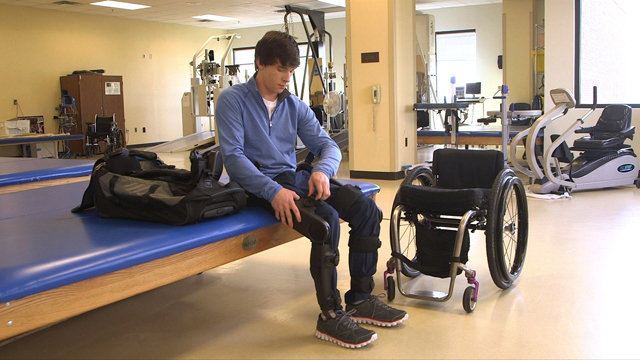 A single-hand strapping and retention system allows Indego to be put on, taken off and adjusted to fit without assistance. Indego Personal allows personal mobility on a variety of surfaces both indoors and outdoors and can even be worn while sitting in a car. With up to four hours of continuous use, a fast charging battery allows for extended use at home and in the community. Designed from the beginning for personal use, the features of Indego Personal make it well suited for use at home and in the community. Indego is a powered exoskeleton worn around the waist and legs which allows gait impaired individuals to stand and walk. Indego comes in interchangeable sizes and can accommodate heights ranging from 5’ 1’’ to 6’ 3’’ (155 – 191cm) and weight up to 250lbs (113kg). Currently Indego can be used with spinal cord injury levels of T3 to L5 in community or home settings in the US and is available for persons with lower extremity weakness due to paralysis or other neurological diagnoses in Europe. The Indego is not intended for sports or stair climbing. Can I schedule a test session? We are happy to organize a test session for you. Please complete the contact form on the CONTACT page of this site. Please completepage of this site and you will receive a quotation shortly. Is Indego covered by insurance companies? Indego is not currently covered by insurance companies. For funding options, please visit helphopelive.org. Indego Personal offers people with mobility impairments a new level of independence. Download the Indego Personal Brochure for more information. Download the Indego Personal Datasheet for important technical data for an individual user.